It's nearly winter and it's cold but, where I live, at least there's no snow or frost ... yet. So am I still working in the garden? Yes. As much as I'd love to be indoors, tucked up with a good book, a couple of Hobnobs and a mug of tea, these are the many jobs needing my attention outside. The ground is soft after persistent drizzle - perfect for weeding before the soil freezes. And yes, weeds are still growing as the temperatures are averaging 7°C (44°F). I'm holding my breath waiting for it all to change but temperatures in London are forecast to soar (haha) to 14°C (57°F) by midweek and stay mild into early December. But before I shout "woo-hoo!" and race outside to carry on the good work, a reality check will require a raincoat and wellies. The tree branches are now mostly bare, apart from the silver birch below my windows. It's a daily job to clear the ground but I love the thought of the lovely leaf mould I'm making. I've got some wire baskets to store the leaves in while they rot down but have used open topped garden waste bags from the local council in the past. I could use perforated plastic bin bags but would rather not as I'm trying to eliminate single use plastic. As the leaves began to fall from the cherry trees, I was concerned to see that next year's buds have appeared along the length of the branches; this won't be good if a hard winter lies ahead. 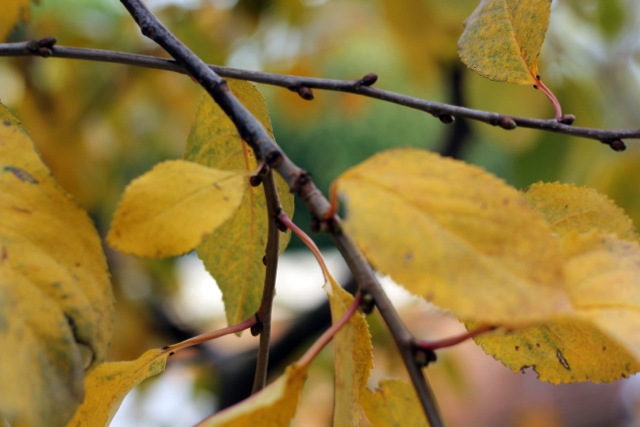 Those yellow leaves have now fallen, revealing a couple of crossing branches. Stone fruit (cherries, plums, etc) should ideally be pruned in the summer but I've tidied up the trees in winter before without consequence. Luckily I'll be touching wood as I prune. Handy, that. I chopped down a few untidy autumn raspberry canes several weeks ago as they looked to be done for the year. The few canes that I left unpruned have gone on to produce lots more berries. I'm amazed, and thankful; a handful of delicious cold berries as I wander the garden is something to appreciate. I know autumn fruiting canes are traditionally left until spring for the big chop but I've cut mine in late autumn for several years now, confident of the advice given by plant biologist and author, Ken Thompson. 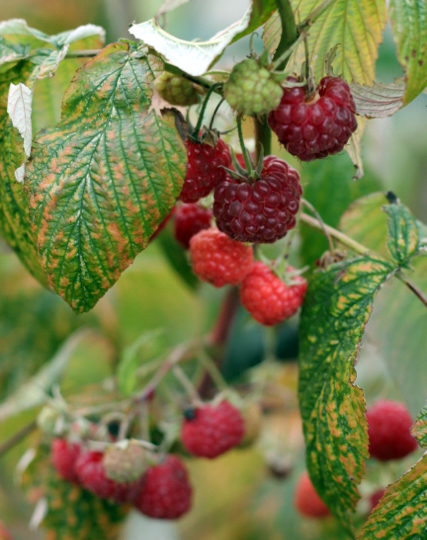 He prunes back all his raspberry canes, both summer and autumn fruiting, before winter - and he lives in Sheffield, Yorkshire, where it's a bit chillier than London. Beware the yellow (or white) carrot! 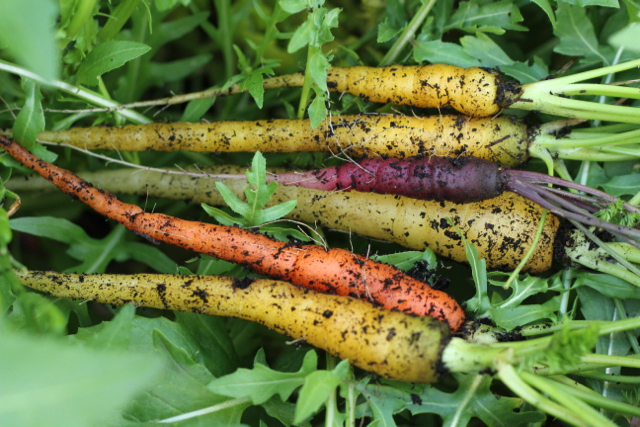 These are the last of my self-styled 'lucky dip' carrots, from a pack promising a rainbow of colours. The prospect of jewelled roots was a tantalising thought as they grew but by the time I'd pulled the umpteenth yellow carrot the novelty had worn off. They're very pretty but looks aren't everything. The purple and orange carrots trumped the yellow ones for taste. James Wong in his book 'How to Eat Better' writes that purple-to-the-core carrots have the highest levels of polyphenols, ten times that of yellow or white carrots. For now, that's good enough to sway me; I'm growing purple next year. Carrot seed is better when fresh so I can replace my seed without feeling guilty. A three metre hedge/windbreak, grown from just the one self-sown achocha seedling, borders one side of the veg patch. That's Fat Baby Achocha for you - 16 foot multi stemmed vines will grow sideways if they can't go up. I hadn't intended growing achocha this year but when nature steps in, who am I to argue? Free food, minimal effort? Yes please. Achocha can be used in any recipe that calls for bell peppers; I eat the small ones whole (they taste of peppers and crunchy cucumber) and will make achocha jam with the larger fruits. 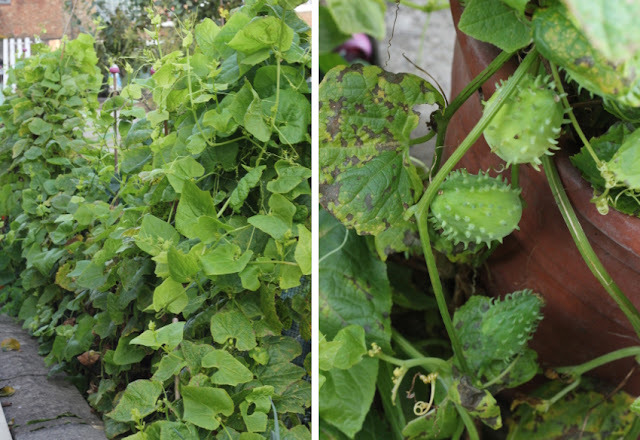 The vine is slowing down now but will carry on until winter cold kills it; any large pods falling to the soil will germinate next spring and be put up for adoption; I want to give the bigger variety, known as Giant Bolivian Achocha, a go next year. I love having freshly picked asparagus each spring; despite having only three crowns left, they produced enough quality spears for me this year so I've left the ferns for as long as possible to re-energize the crowns. They've now yellowed so it's time to cut them back to base. The yellowing ferns also provided a windbreak for the tomatoes planted into the 'square foot' bed; tomatoes which, to my amazement, are still slowly ripening. Wow. Hot summer equals no blight spores. In that same square foot bed, a cape gooseberry/Physalis plant has appeared. This is somewhat of a miracle in my book as no seeds were sown this year - could a dropped seed have lain dormant for three years in the soil to germinate in the heat of the summer? I haven't had much success with growing Physalis in recent years; even the plants that grew well at the allotment last year didn't fruit in time, unlike my first batch of veg patch plants that fruited prolifically and grew as short lived perennials through mild winters. This little miracle plant will be dug up and repotted into a sheltered spot so it has the best chance of surviving winter's chilly fingers. 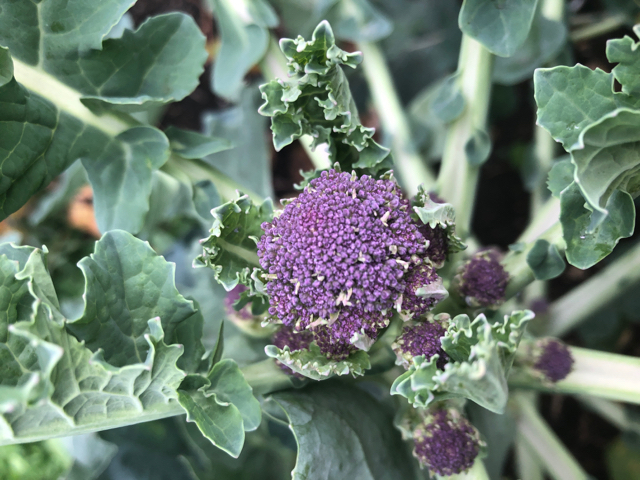 At the other end of the veg patch I have five enthusiastic purple sprouting broccoli plants. 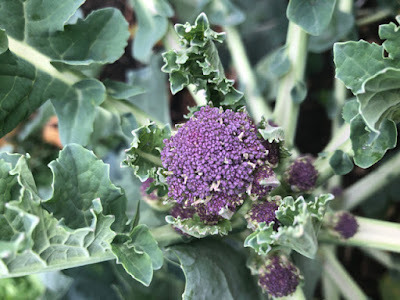 I chose seeds specifically so that plants would fruit in succession, from summer through to late winter - but the dry heat of summer put paid to that. The plants are now starting to form heads, all at once. I'm hoping that shorter days and cooler temperatures will check this growth as I need some of the plants on hold for a winter crop. Somehow, that seems like wishful thinking - thank goodness for Cavolo Nero kale! This kale grew from a dropped seed after the seedheads and flowers were left for pollinators to enjoy. I transplanted the 6" seedling in spring (it survived the harsh winter without any help) and I've enjoyed the leaves all summer. Looks like it will keep going through winter as well! Jobs to do this month ... in fact asap! 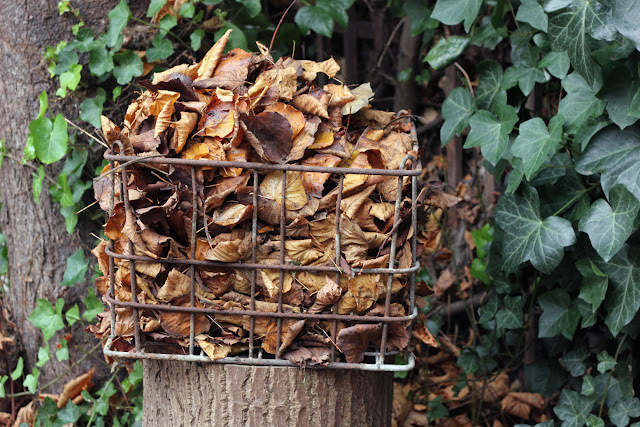 Gather up leaves and store in a mesh bag for leaf mould. I collect leaves from the gardens here, not the street leaves which are more likely to be polluted. I have enough to fill a couple of big garden bags; these will take a couple of years to rot down but it will be worth it. Cut back hellebore foliage. Hellebores, aka Lenten Rose, will be getting ready now to flower in spring. 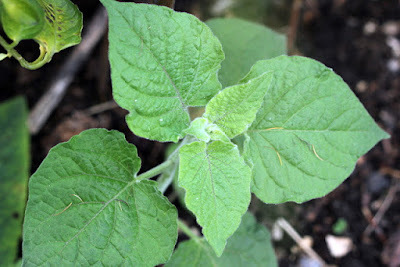 Cut the big old leaves off at the base of the plant to allow new leaves and flowers to develop. Mulch! Put last year's leaf mould and compost to good use by mulching around hellebores and other perennials now and put a mulch over any beds or planting areas not in use over winter. Plant garlic cloves. I had a crazy idea to edge the veg patch path with garlic and spring onions next year to free up a bed for other crops. Plant onion sets. I just have to work out where to plant them, given all the other crops I'll need space for! But first I'm going to dig up and relocate self-seeded flowers. It's also a good time to move any dormant perennials - prepare the planting hole (or container) before moving them. 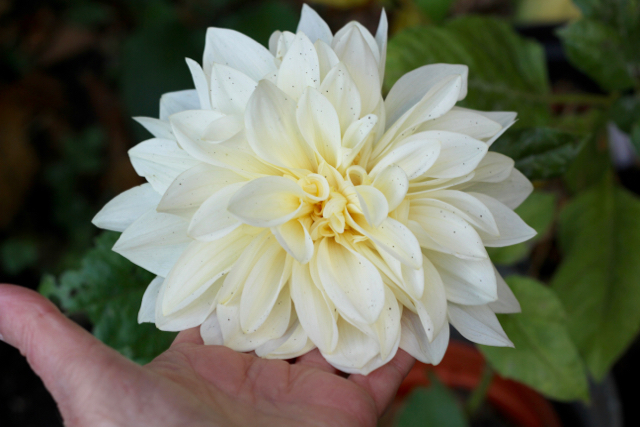 Pot up and bring in any tender plants - dahlias, I'm looking at you. I also have chillies and pepper plants outside, and then there's the cape gooseberry to protect as well. 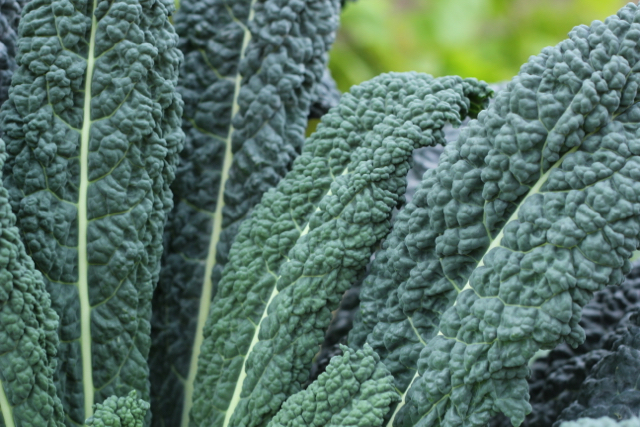 Pop a protective layer of horticultural fleece over tender crops like winter lettuce, pak choi and spinach; chard, purple sprouting broccoli, cabbages and kale are very hardy so don't need protection. why not add it to Pinterest? And follow my UVP page on Facebook! With a large cup of tea and slice of cake as well I hope! But you surely visit the allotment and grow crops through the winter, Sue? You have reminded me that I have yet to uproot the Dahlias in tubs either side of my front door. I will, I will... (It's colder in Edinburgh than London). Now Achocha is the main railway station in Madrid, isn't it? Lol! love the joke, Mal! Made me smile, anyway! :) My dahlias are also in tubs as it's my first year of growing them; if they were in the ground, I'd probably just mulch over them ... but if I lived in Edinburgh, I'd have everything under cover, just in case! Who knows what the weather will throw at us over the next three months. No, you're not mistaken Anna. Carrot roots were purple, white or yellow pre-17th century but the Dutch modified carrots to orange in honour of William of Orange. The trend caught on as Dutch farmers were the carrot growers of the day. Extraordinary that we're now turning back to the original colours. I let carrots run to seed one year and got purple umbellifers from orange carrots. So exciting to be planting roses and a quince! I wish you lots of joy with those - I really need to find a space for roses in the veg patch; the roses already here are very very old and with practically no scent at all! That's interesting to see the colorful carrots! I have never grown that variety. Rainbow carrots are great fun to grow, Endah. I've seen seeds for red carrots as well but I think orange will always be favourites. Winter arrived about a month early around here - many of the trees and shrubs hadn't even dropped their leaves yet, which was an odd sight to see in one of our record lows a few weeks ago when it dropped to -17C! I'm with you on the yellow/white carrots - more of a novelty than a taste sensation. I much prefer the purple or "boring" orange. Do you eat the purple carrots raw in salad or cooked? If cooked does the purple colour hold like beetroot? Would definitely choose a rainbow purple over an anaemic yellow! There are still plenty of jobs to do in the garden or allotment. I made a list and I know it will take me ages to get through them all. Someone gave me a cape gooseberry seedling earlier this year. I didn't know what to do with it so I grew it in the allotment greenhouse. It produced loads of little fruit but none of our family liked them. I've been reading how it's good for our gut to eat different coloured veg. Looking at your carrots it occurs to me you could practically have a balanced diet just eating carrots!